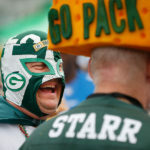 It was another tough overtime lose for the Green Bay Packers this past Sunday at Lambeau Field in Green Bay, Wisconsin. The Miami Dolphins won with a field goal in overtime. Here are a few of my favorite photos. 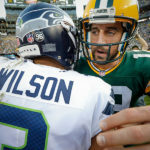 I think my photos show that it was a tough day for quarterback Aaron Rodgers. 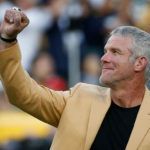 Next up for the Packers is the Minnesota Vikings and Brett Favre at Lambeau Field next Sunday night. After Sunday’s game the still photographers gathered at the Packers G at midfield to take a knee in honor of long time Packer’s photographer Vern Biever who passed away earlier in the week at the age of 87. 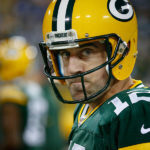 Green Bay Packers quarterback Aaron Rodgers show a little fear in his eyes as he looks for a receiver. Green Bay Packers cornerback Jarrett Bush and cornerback Tramon Williams tackle Miami Dolphins cornerback Nolan Carroll. Green Bay Packers tight end Tom Crabtree tries to get away from Miami Dolphins linebacker Karlos Dansby. 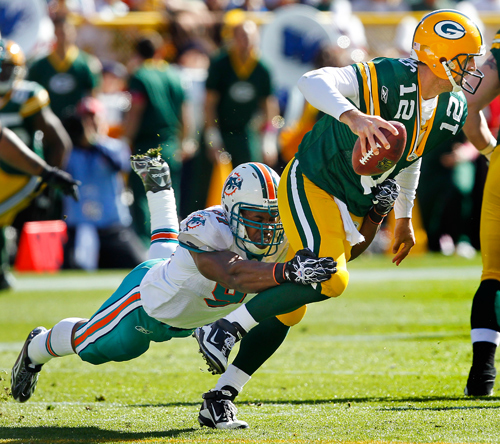 Miami Dolphins linebacker Cameron Wake sacks Green Bay Packers quarterback Aaron Rodgers. Green Bay Packers safety Nick Collins and cornerback Sam Shields break up a pass intended for Miami Dolphins wide receiver Davone Bess. Miami Dolphins quarterback Chad Henne tries to escape the defensive pressure of Green Bay Packers linebacker Desmond Bishop and linebacker A.J. Hawk. Miami Dolphins wide receiver Brandon Marshall can get both feet inbounds for a possible touchdown as Green Bay Packers cornerback Tramon Williams defends. Miami Dolphins linebacker Ikaika Alama-Francis takes down Green Bay Packers cornerback Pat Lee. Miami Dolphins wide receiver Brian Hartline goes up for a pass as Green Bay Packers cornerback Charles Woodson slips while defending. Green Bay Packers wide receiver Donald Driver looks for running room down the sideline as Miami Dolphins cornerback Sean Smith tries to defend. Green Bay Packers quarterback Aaron Rodgers tries but can't escape the defensive pressure of Miami Dolphins linebacker Koa Misi. 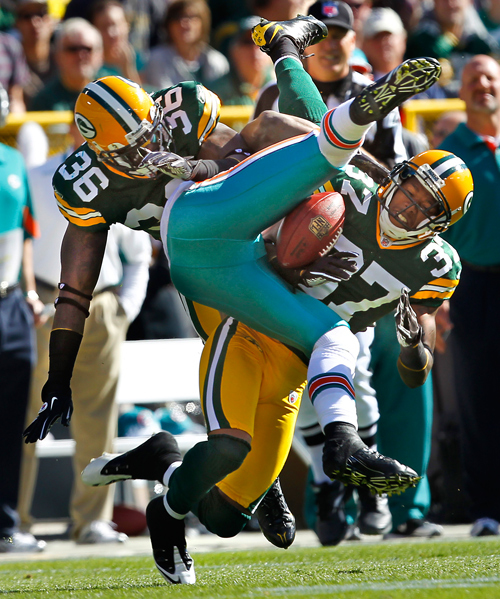 Green Bay Packers cornerback Tramon Williams takes down Miami Dolphins wide receiver Brandon Marshall. 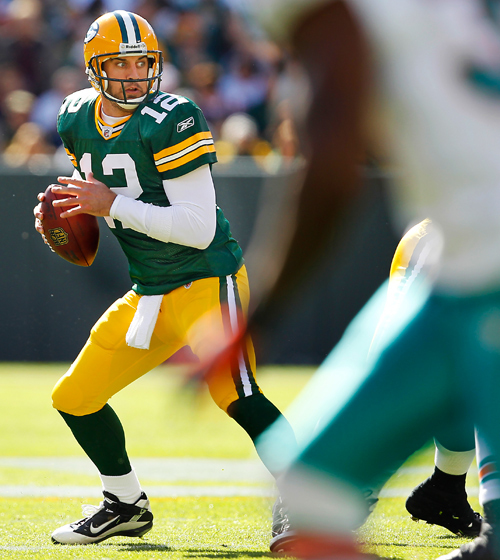 Green Bay Packers quarterback Aaron Rodgers ties to escape the pressure of Miami Dolphins linebacker Koa Misi. Miami Dolphins place kicker Dan Carpenter celebrates a game winning field goal in overtime. Photographers take a knee after the game around the Packers G in honor of Green Bay Packers' long time team photographer Vern Biever who passed away at the age of 87 earlier in the week. At the upper left of the photo is Vern's youngest son Jim who is the current team photographer. 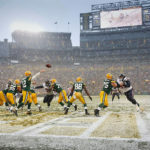 Vern's oldest son John is one of Sports Illustrated's top photographers. Thanks to Jeffrey Phelps for sharing this photo. « Photos of the Milwaukee Bucks vs. Charlotte Bobcats in NBA preseason basketball.